Many thanks again to Kristen Lopez for inviting me on her Ticklish Business podcast to talk about Rita Hayworth. Listen to part 2, our conversation about the movie with the worst Irish accent, the worst Hayworth haircut, but the best fun-house mirror denouement, The Lady from Shanghai, directed by and co-starring Hayworth’s then husband, Orson Welles. If “Won’t You Be My Neighbor” has you missing Fred Rogers, take a listen to this Motley Fool podcast interview about parenting, kids, and money, filled with Mr. Rogers’ quiet decency. I never miss an episode of Slate’s Spoiler Specials, the discussions of movies for those who have already seen them, so there is no need to avoid spoilers of plot twists or surprise endings. 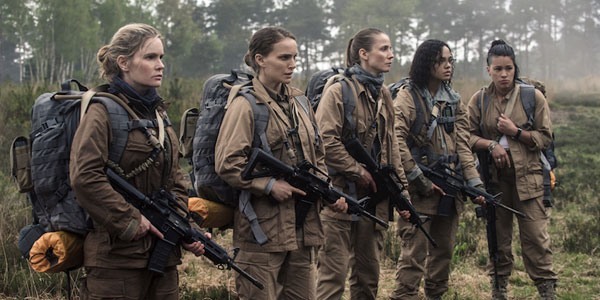 There couldn’t be a better choice of movie for a spoiler-filled discussion than Annihilation or a better trio to discuss it than Dana Stevens, Inkoo Kang, and Marissa Martinelli. They may not answer every question, but they puzzle along with you in an exceptionally thoughtful and enlightening conversation. Jesse David Fox hosts “Good One,” with each episode a discussion of one joke with the comic who wrote it. Guests include Jim Gaffigan, Kristen Schaal, and Neil Brennan. Homecoming is an immersive audio mystery drama with sound effects, like in the old days of radio, starring Oscar Isaac, Catherine Keener, David Schwimmer, and David Cross. Thanksgiving is about more than food and football. It is about family. As long as you are all together, how about putting down your devices and sharing some family stories? StoryCorps is asking high school teachers to assign their students to record family stories this Thanksgiving. But it is something every family should try, and the app makes it very easy. Previous PostPrevious Happy Back to the Future Day! What Did the Movie Get Right?